We couldn’t agree more – Amish Quilts make great gifts! Many thanks to Richard Cooke, Associate Editor at Signpost Magazine kind words about our products. 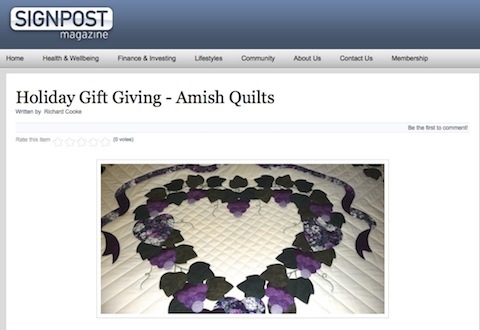 “Holiday Gift Giving – Amish Quilts” is an insightful article. Be sure to read it and provide comments. And share, share share with your friends.